While there are plenty of serviceable dice rollers available in the iTunes App Store (my favorite is Quick Roll), sometimes you need to see the results of a very large batch of random numbers at once. drig, or DRIG Random Integer Generator, is a recursively named random number generator that works within Mobile Terminal. It helps to think of drig as a dice roller with custom dice. You can type in “drig X Y“, where X is the number of sides the dice have and Y is the number of dice being rolled. If you play Dungeons & Dragons, this would be YdX in dice terminology. I can think of a couple reasons why you might want to use drig: you could use it to pick lottery tickets at random, to set a code for your household security system, to roll for massive amounts of numbers in a large-scale war game, or just to impress your friends with authentic looking hacker gibberish on the screen of your iPhone. You can even have your phone calculate absurdly long dice rolls and watch them scroll down. My only gripe with drig is that it is not a fully featured dice roller. Drig does not accept dice rolls expressed in gaming terminology, such as 3d6. There is also no way of boosting the results, like with 3d6+2, or of introducing other mathematical functions to the virtual dice. Drig does not sum up the results, it just lists them. Quick Roll can do everything drig can and more, but Quick Roll is a paid app ($0.99) and drig is absolutely FREE. In addition, drig instantly reveals the results of each roll, instead of having to tap to the History page. 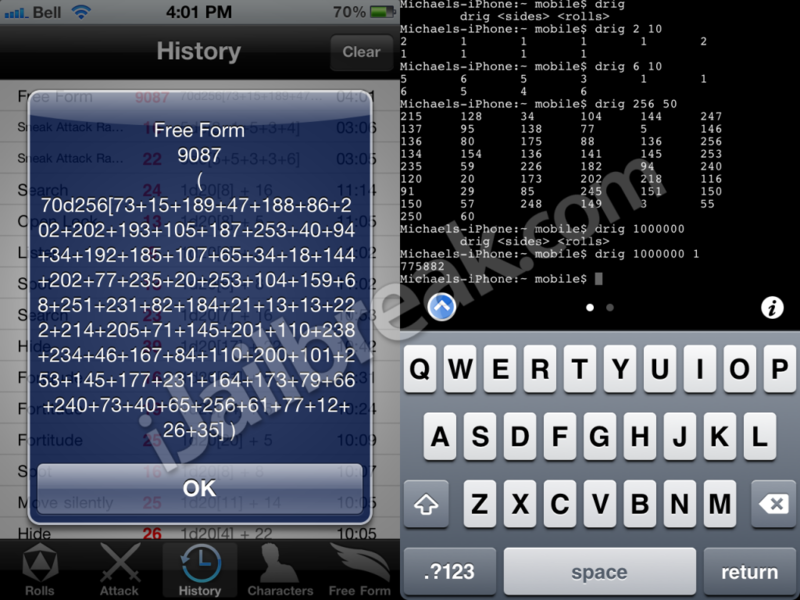 Drig gets bonus points for running on a Mobile Terminal screen. Isn’t that way better a polished GUI? Quick Roll versus drig. While drig doesn’t have as many features, it is really good at displaying individual rolls. 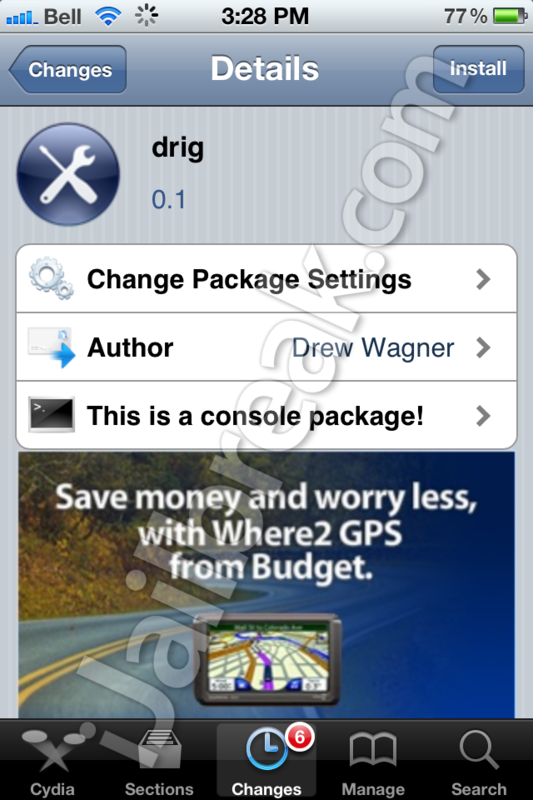 You can find drig in the BigBoss repository on Cydia. Drig does not install an icon; instead drig is activated through Terminal.